On August 13th, mechanics and technicians who maintain the U.S. Navy P-3 Orion planes at Naval Air Station Whidbey Island overwhelmingly ratified a first collective bargaining agreement. 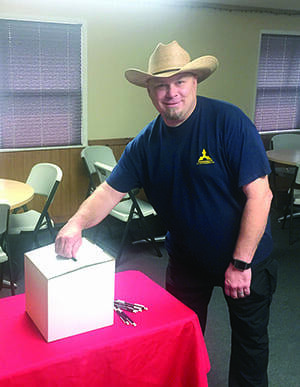 The workers there had voted to join District 751 on July 10. Member Steve Jolly looked pleased as he cast his ballot that secured a first contract for workers at KAI. A membership meeting was held on Saturday, August 11 to provide members an opportunity to hear details of the first agreement and get their questions answered a couple days before casting their vote. A 5.5% or more general wage increase effective 9/1/18 and a 3% general wage increase on 9/1/19 and 9/1/20. Established a grievance and arbitration procedure to resolve disputes so the employer must have “just cause” for discipline. Contributions to the IAM National Pension Plan. Holden served on the union negotiating committee along with Chief of Staff Richard Jackson, 751 Attorney Spencer Thal, Business Rep Paul Veltkamp, and Mark Blau a member of the bargaining unit at KAI. Thanks also to Suzan Merritt for her support throughout the negotiation process. This first contract with KAI at NAS Whidbey is another example of how IAM District 751 continues to raise the standard for those in our community and specifically the 40+ members who perform critical work for the U.S. military. See the original article in the District 751 Aero Mechanic Newsletter. The post First Contract for District 751 Members at Whidbey Island Naval Air Station appeared first on IAMAW.